​This is the third in a series of photo essays to challenge the false narrative about immigrants and refugees. This time it’s about asylum seekers at the southern border. This is not about understanding immigration issues and border control- it’s about humanity. While I won’t indulge myself in a discussion of politics, I will say that in the past two years the United States appears to have lost some of its humanity. If you don’t look right, pray right, love right it seems that the welcome mat has been taken in. But just like the false narrative about immigrants and refugees that they are coming here to do harm, it’s also a false narrative to think that all or even most Americans have closed their eyes to the words inscribed on the Statue of Liberty. 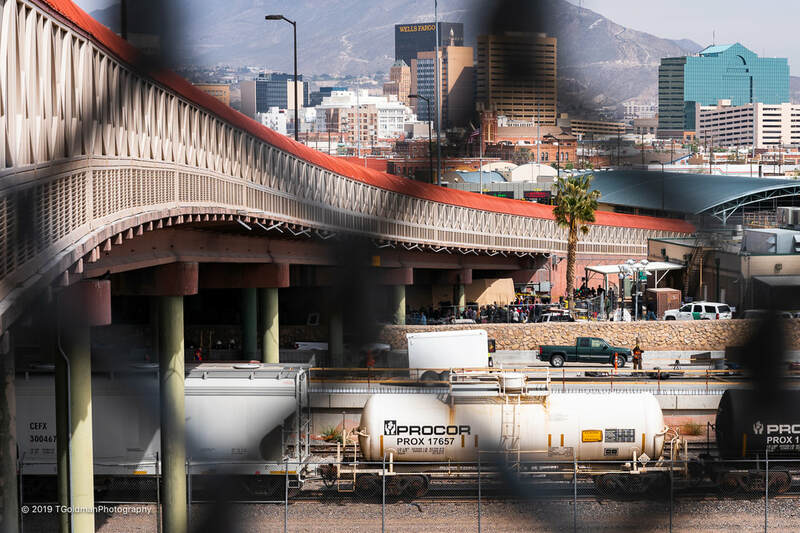 My journey to find humanity took me to El Paso Texas, a major port of entry for asylum seekers from Central and South America, parts of Mexico and Cuba. It’s also and a major location for caregivers and volunteers from around the country who are there to roll out the welcome mat and to declare that America’s humanity will not be defined by a wall! 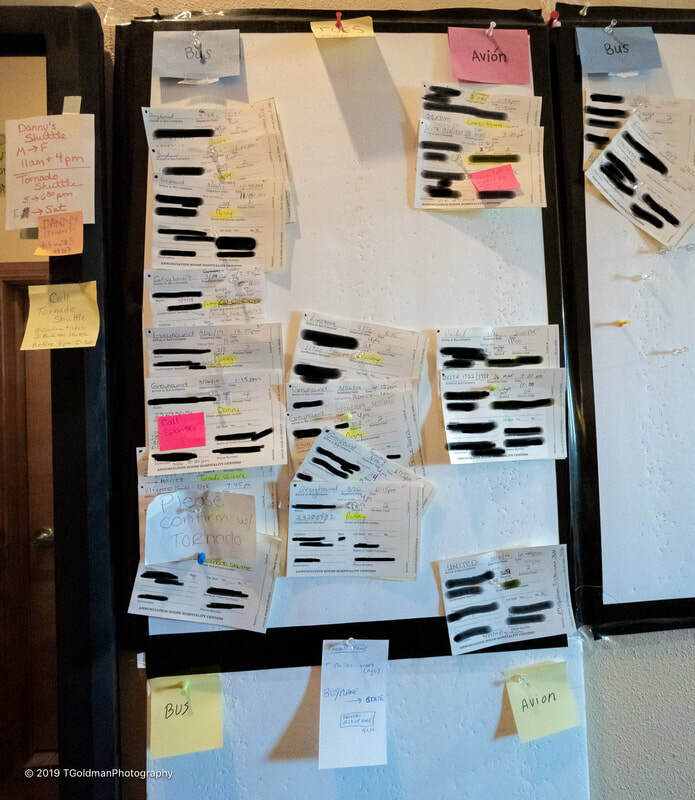 ​When the family separation crisis emerged in 2018 someone suggested that I go to the southern border to do a story. My first reaction was there was nothing I could bring to it- there was so much media covering the story. But it was an open letter from Sister Norma Pimentel (Catholic Charities of the Rio Grande Valley) in the Washington Post addressed to President Trump that changed my mind. She spoke about what he would have seen had he stopped there on a trip to the border- he didn’t stop. Her description of the asylum seekers was palpable but there were no images. It was then I knew I needed to go there with my camera. I could have just gotten on a plane but I wanted some sort of welcome that would provide guidance and access. Sister Eileen McNally, Refugee Coordinator for the Sisters of St. Joseph in Philadelphia, who just returned from volunteering at El Paso, connected me with Mary Bell. Mary, who is very devoted to helping immigrants and refugees, was going to El Paso to volunteer on behalf of the Archdiocese of Philadelphia. Mary was looking for a companion and the Archdiocese was looking for a journal describing what’s happening in El Paso- I was the perfect fit. The Archdiocese graciously contributed to our travel expenses. My week in El Paso was more than enlightening- it was life changing! 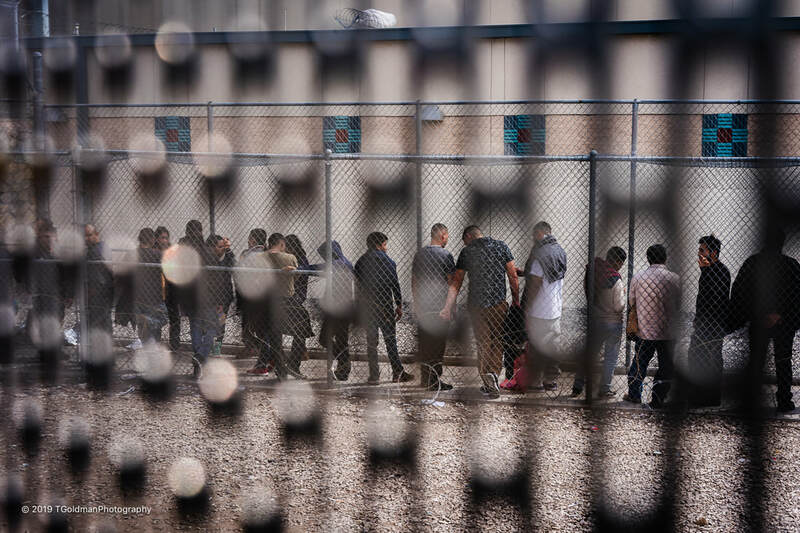 As of early 2019, ICE (U.S. Immigration and Customs Enforcement) was releasing 300-400 asylum seekers per day- a staggering increase from the more typical rate of 300 per week. In fact, the week I was there the number spiked to over 800 and there was talk of reaching 1000 per day. Typically the release is to Annunciation House, an extraordinary organization that provides the first friendly welcome for travelers who have come such a long way from countries that have become unbearable. 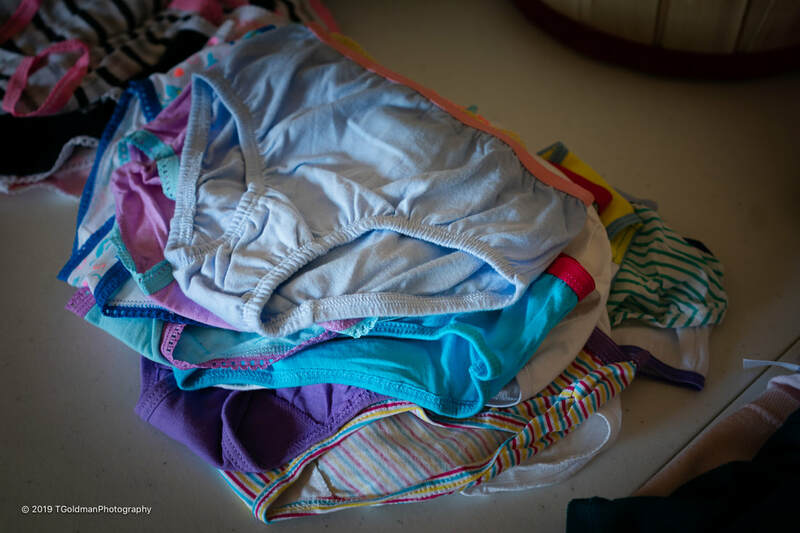 The care provided by Annunciation House requires enormous funding and support. This is an effort that can only be described as heroic. 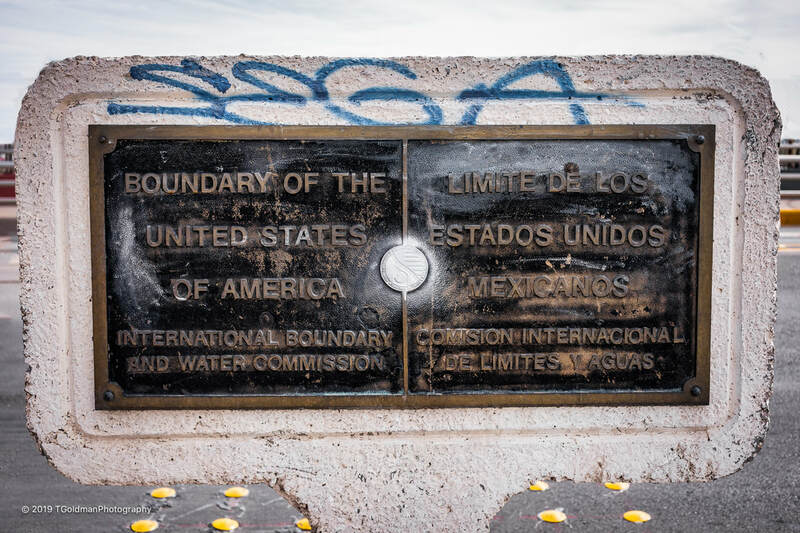 My purpose for going to the southern border was not to investigate policy or process, though these are indelibly connected to any story. My purpose was to find humanity in two groups: the asylum seekers- who they are as people; and a group that gets little or no attention- the volunteers who give so much of themselves to provide aid and comfort to the masses of asylum seekers during the few days between detention and traveling to relatives in the U.S. I came to the border to find humanity and, as always, the humanity found me! 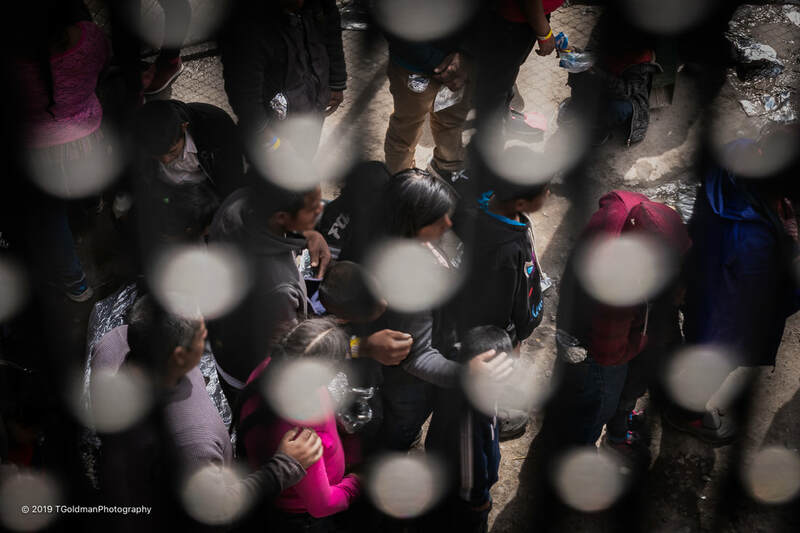 Humanity is often the response to inhumanity and that is certainly the case at the southern border. I didn’t go there to see inhumanity, but it wasn’t avoidable so this is where I'll begin. ​As part of my visit to the southern border I wanted to see the wall and the infamous detention pens said to be under bridges between the United States and Mexico. I wasn’t planning to go on my own, but I was assured that with my passport there would be no problems in either direction. So I parked near the border, paid fifty cents and began the climb across the southbound bridge. There was almost no foot traffic going across- I had the bridge to myself. ​I stood on the dividing line between the two neighbors thinking that I should have some of out-of-body experience given all the commotion. Going to Mexico must be like stepping into a terrible place whose only claim to fame is crime, drugs, and really bad people. But all I could think of was two countries coming together as friends and partners- that’s what I wanted to feel: “Imagine there's no countries; It isn't hard to do.” (John Lennon). Looking across to the northbound Paso del Norte Bridge reveals “The Big Beautiful Wall,” which is actually a steel-slatted fence. The famous Rio Grande today is not much more than a stream. Noting the position of the flags on the bridge just to the left of the orange canopy, the wall is not on the border but in the United States. An asylum seeker who reaches the wall has already entered the United States and should be able to apply for asylum, as I understand it. 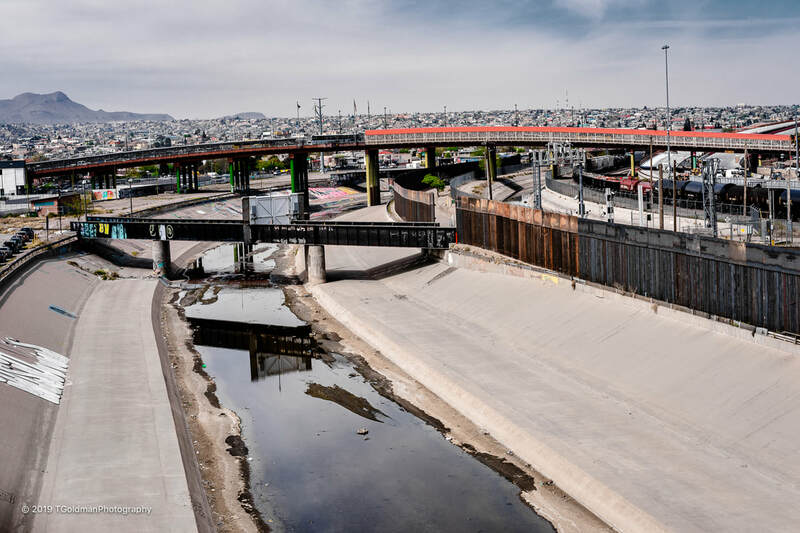 ​After a short enjoyable walk in Juarez, while known for crime it seemed very friendly, I paid fifty cents and began the walk across the very crowded Paso del Norte Bridge. If I was going to see a detention pen, this would be it. A small lookout on the bridge just before the border brought it into plain sight- a chilling sight. It was appropriate that I was behind a chain linked fence as were the asylum seekers, but of course I was free. There was no loud talking and no one seemed to be in distress. But as I understand it, these detainees have no idea where they are going until they are put on a bus that will take them to yet another unknown place. People crossing the bridge looked down at the asylum seekers: “Immigration!”... I love the beauty of bridges, but this felt like a “Bridge Over Troubled Water.” (Paul Simon)… Not a memory I will savor. “The rocky place” came into clear view. Look closely- at the top left of this image appears to be a mom holding her son so close… Lady Liberty’s eyes would fill with tears at this sight. ​People line up for food. Given the yellow wrist band, the man handing out sandwiches appears to be an asylum seeker- as I would learn, they always want to help. ​The foil blankets appear to be very disposable. ​A man holds his wife’s shoulder. A dad and mom wrap themselves around their sons… It’s about family! ​Guards watch over their captives… Someone in a wheelchair sits by themself. ​Our welcome mat is chain linked fencing and barbed wire. As humiliating as it looks, it must be better than where they came from… But can’t we do better? ​Now that I’ve shared the inhumanity at the southern border, let’s return to where this journey began- looking for humanity. 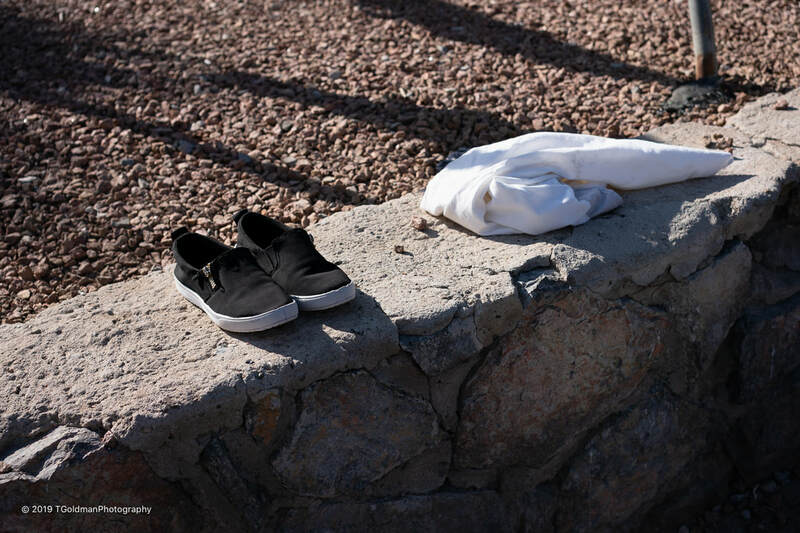 ​And a pair of shoes drying in the sun. There was a group of men and a few children playing nearby. From inside the car I gave a small wave to the men. They responded with friendly smiles and big waves as if to welcome us. 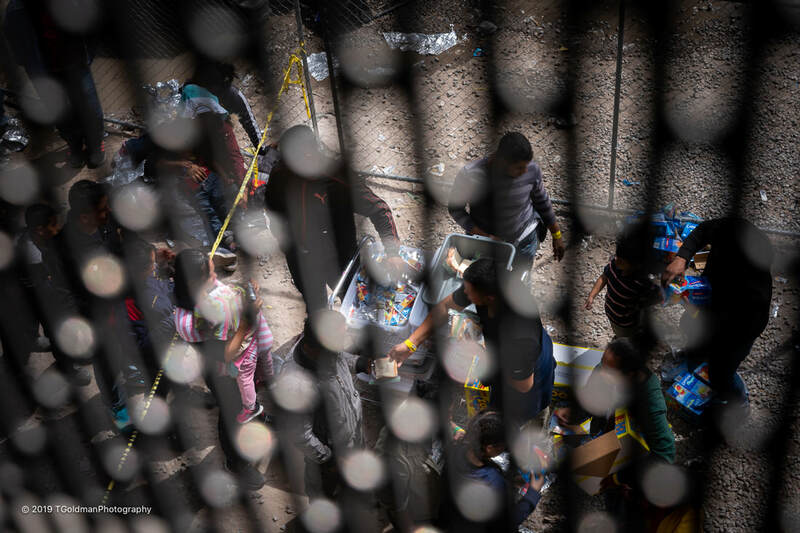 From the first moment we arrived the asylum seekers impressed me as lovely gracious people- every interaction I had during my week in El Paso only reinforced this view. If there were gangsters and terrorists, they were hidden from view! People stopped by the car: “Buenos Dias,” always with a warm smile. What I saw was people who seemed to be in good health and happy, at least that’s what it looked like- this is not what I expected. I wanted so much to take pictures but I had been asked from the very beginning not to take identifiable pictures of people at any of the so called hospitably centers. I will share what I saw so that readers can “see” though my eyes. When I checked into my hotel there was a large gathering in the dining area. The staff told me this was dinner for a group sponsored by Annunciation House. It appeared as people quietly enjoying a good meal. So my first impression of the asylum seekers is that they looked well, were dressed in decent clothes (perhaps these were provided), and seemed happy. I didn’t know if this was representative, but it was my first impression. The other feeling, which was much more than an impression, was that there is a huge outpouring of care and support for these new arrivals. Its founder and director, Ruben Garcia, can only be described as a modern day “Superman” doing on a daily basis what seems totally impossible. Every warm bed, every meal, every shower, every change of clothes, every trip to the bus station that the asylum seekers receive has been touched by Ruben’s guiding hand. I’m sorry that I didn’t get to meet him, but I felt his presence everywhere someone was being cared for. 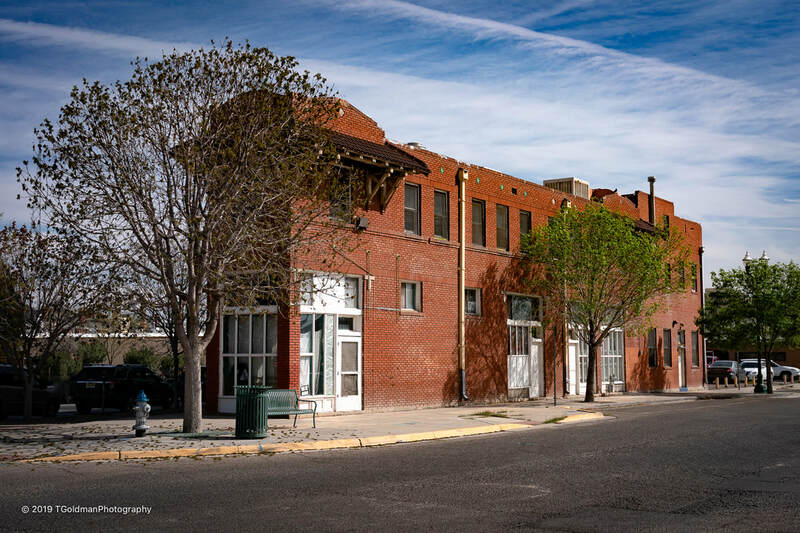 ​The physical image of Annunciation House is a small red brick flatiron like structure squeezed between two streets in downtown El Paso, just a few blocks from the border. A young women came through the door asking what I was looking for- I was clearly not welcome inside. I assumed a staff person would be there but it was just this volunteer. She explained that this building is a shelter, which was confirmed by a sweet little face peering through a nearby window. This volunteer actually lives in the shelter and manages another outpost hotel: There’s that humanity thing showing its face again. She explained the dramatic increase in the number of asylum seekers that Annunciation House was receiving. It’s unfathomable that they can keep it all together and find funding and volunteers for this massive operation. I had found ground zero for humanity at the southern border. It doesn’t look like much, but it’s so more than much! I delivered the donations that Mary Bell brought from Philadlphia- every drop into Annunciation House’s bucket adds up to a flood of humanity. ​My understanding of the process: Once asylum seekers present themselves to the United States government (requesting asylum at a border or being arrested for an illegal crossing after rejection at the border), CBP (U.S. Customs and Border Protection) takes possession of the people and all of their belongings- everything is taken such as backpacks, belts and shoelaces presumably because of the great harm that could be caused by such “weapons!” Asylum seekers are detained for up to several days. At some point CBF transfers asylum seekers to ICE. For years in El Paso there has been an arrangement where ICE would then handoff asylum seekers to Annunciation House. Bus loads are taken to the various hospitality centers where asylum seekers are greeted with a warm friendly welcome (perhaps the first humanity they have felt in a long time), intake to determine who they are and where they are going in the U.S. (most have family in the U.S. who provide bus or plane tickets), three meals a day for one or two days, medical care when needed, a good night’s sleep in a warm bed (such a relief after sleeping in the cold for days) and delivery to the bus station or airport. 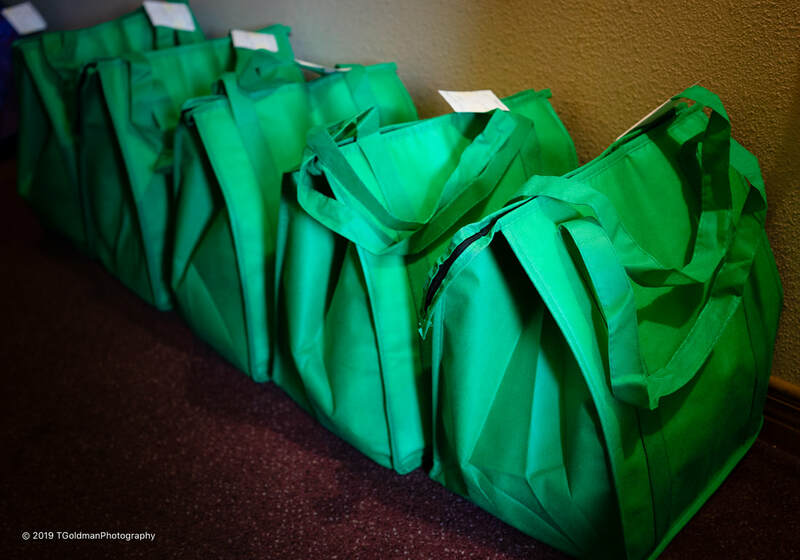 People without sponsors in the U.S., or when the system overloads, are put out on the street or delivered directly to one of El Paso’s bus stations by ICE. Eventually each asylum seeker will have a hearing on their case and I was told that 80% appear as required. This is not a perfect description and I’m sure I’ve missed some details, but this gives a general idea of what has become a human conveyor belt at the El Paso border. 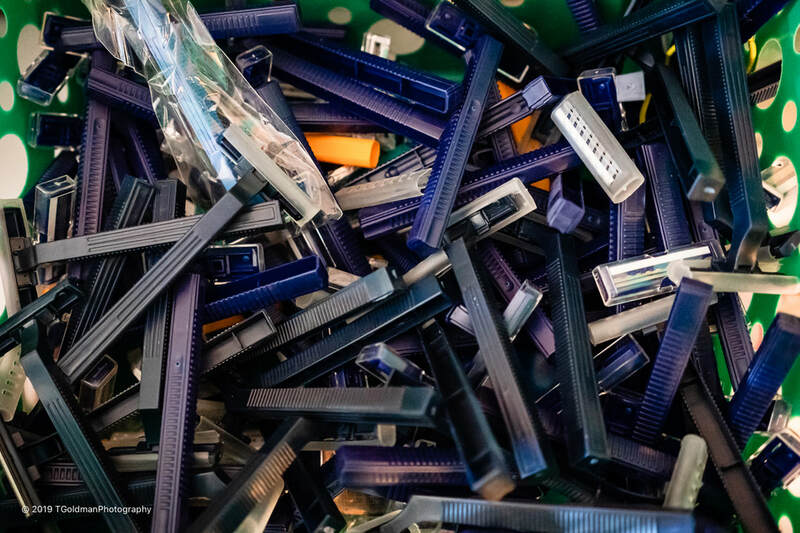 ​On the first morning I accompanied Mary Bell to the location for her two week assignment. It was a hotel that was booked solid by Annunciation House as a hospitality center. The whole story could be told from this one location. 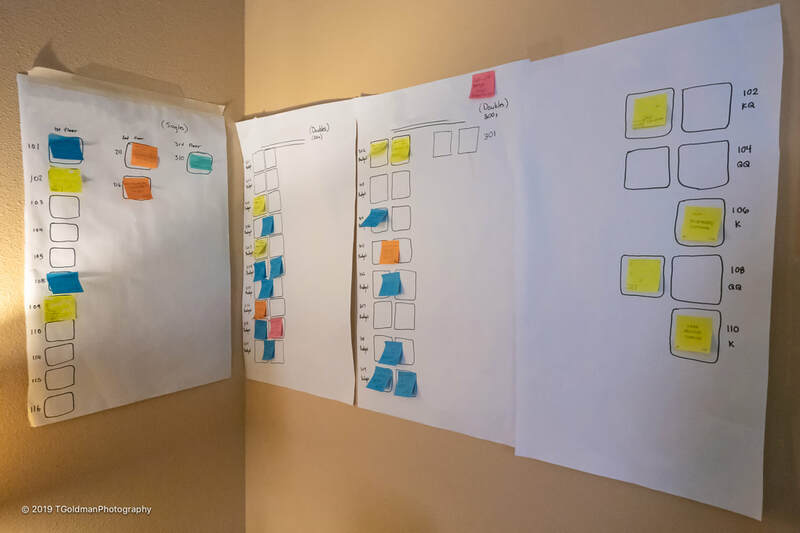 ​The first floor, which included a lobby, breakfast room and several guests rooms, was a buzz with asylum seekers (moms, dads and children) and volunteers. One guest room was mission control for an extraordinary process of caring for new arrivals and sending them on their way into the U.S. The bed was filled with paraphernalia making it look like a Staples warehouse. 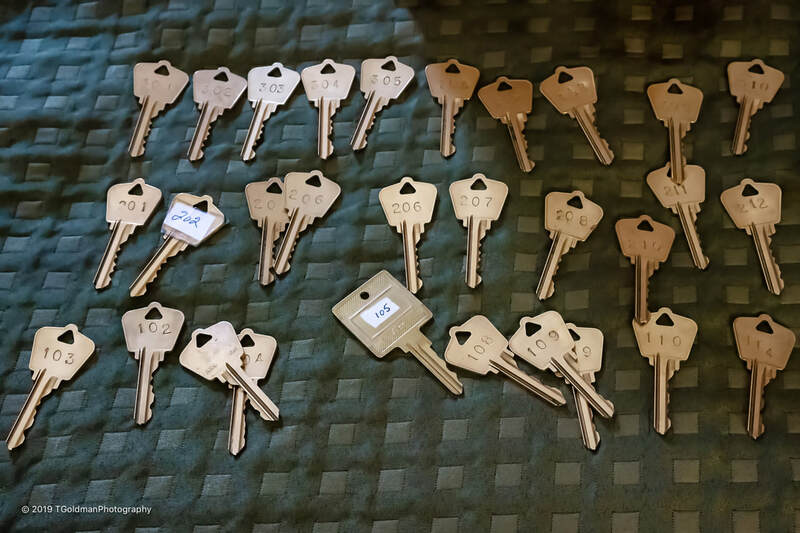 ​The all important room keys were lined up on the bed like little soldiers. For most people it’s just a room key. But to a family that has come from intense poverty, traveled such a long way likely without proper nourishment, and having been detained under harsh conditions, each keys open a door to paradise. 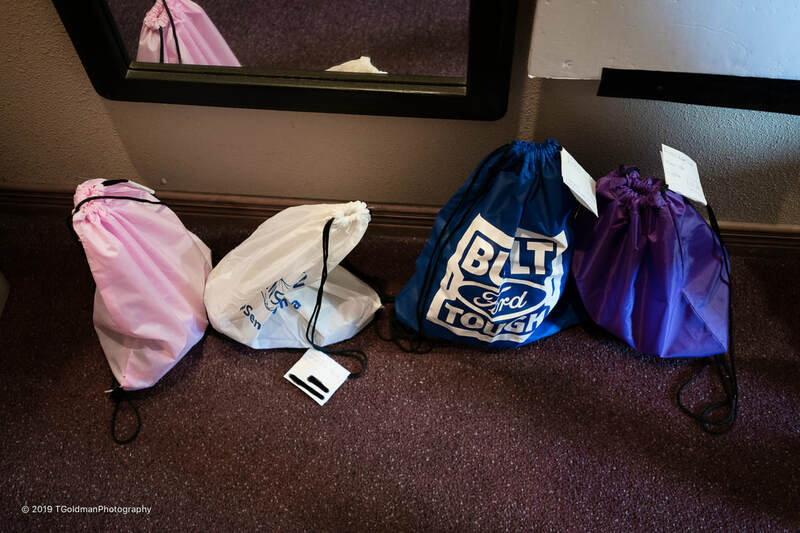 ​With so many people moving through the hotel, military precision is required to manage transportation, meals and…. ​Rooms- who goes where; when are they leaving; cleaning for the next occupants. 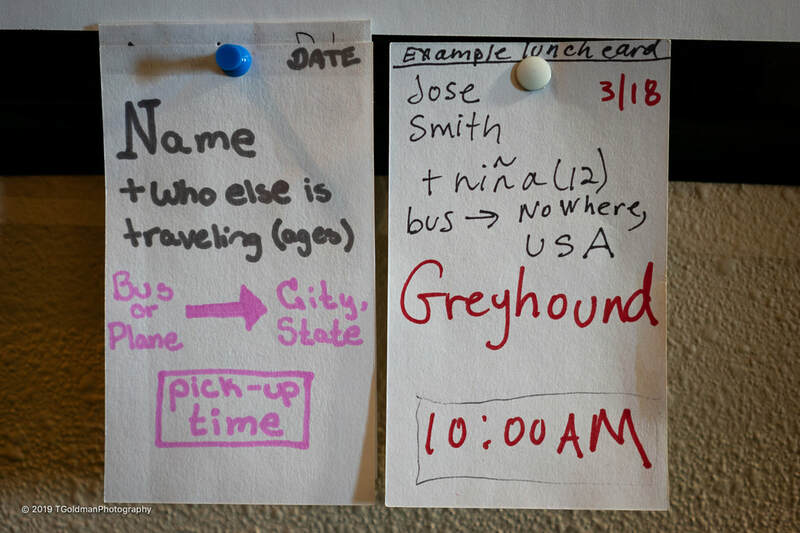 ​With sixty to seventy arrivals each day at the hotel, every bus and plane schedule must be managed- perfectly! ​Most asylum seekers have never been on a plane which is both exciting and scary. ​And large bags for bus trips that can take days- peanut butter and jelly plays the starring role. 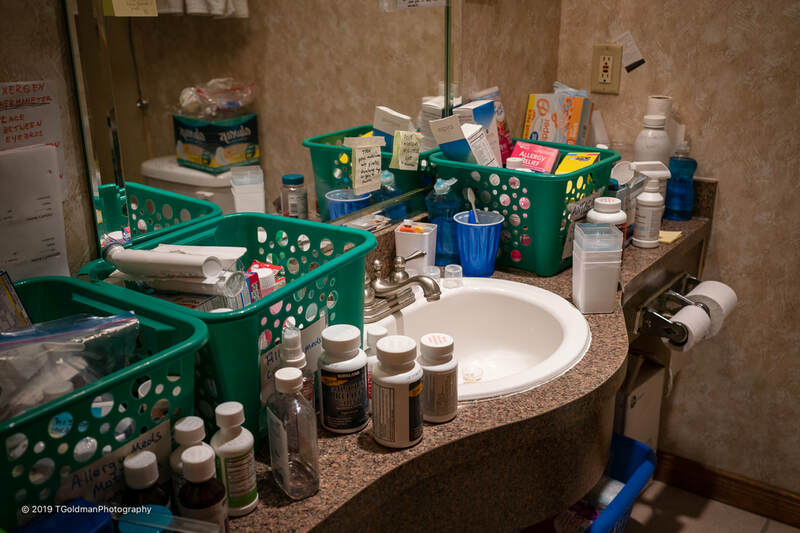 ​Beyond food, asylum seekers need many items because they have absolutely nothing: a bathroom takes on the role of over-the-counter dispensary. 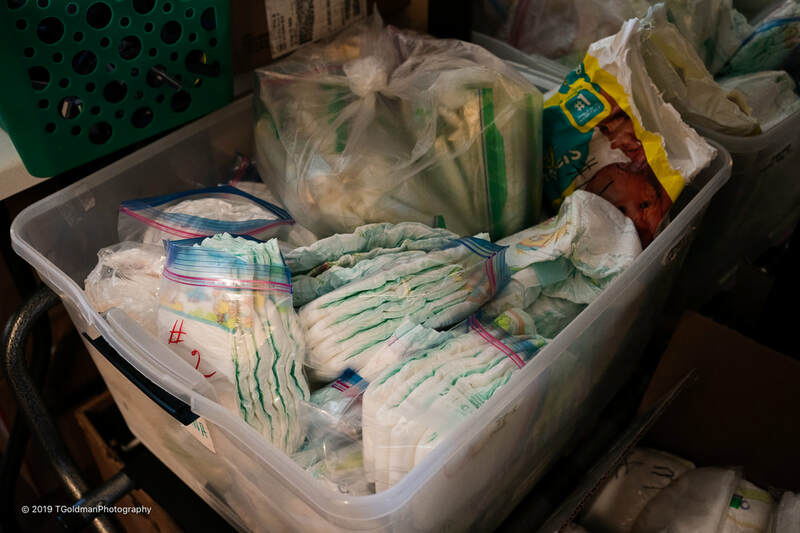 ​A guest room was filled with supplies such as diapers. ​Socks for big feet live in a toothpaste tub. 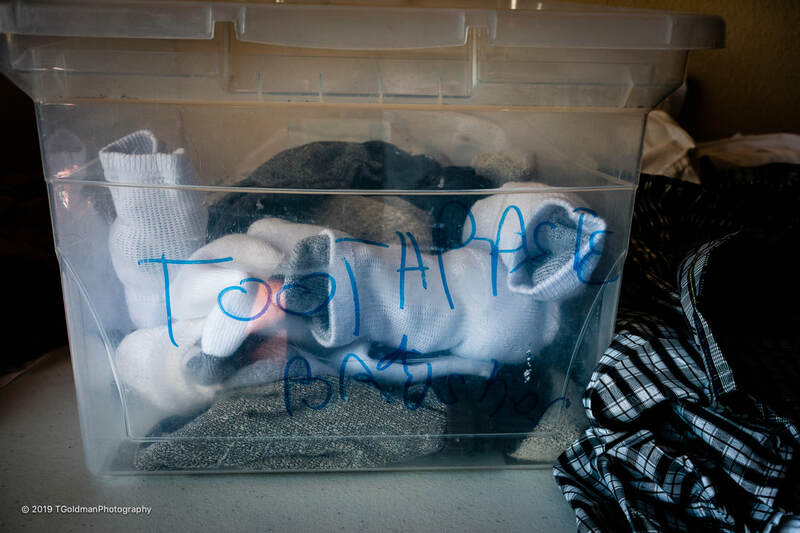 ​Socks for little feet live in a laundry tub. 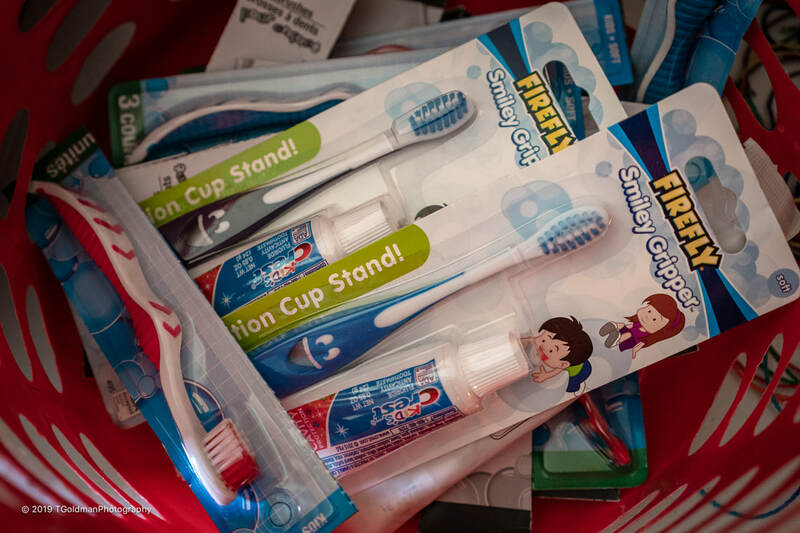 ​Dental supplies for the kids. ​And even a pretty hat. For someone who has food and clothing in abundance, I found these sights both heartbreaking and hopeful at the same time. The asylum seekers are so grateful. ​As poignant as these sights were it was the people who made the biggest impression on me. My typical experience in the U.S. is that people generally keep to themselves, rarely acknowledging strangers. But the asylum seekers, those horrible people from “s… hole countries,” were so friendly. After giving up everything, taking huge risk for their journey and being welcomed into cages, everyone I met in the hotel offered a warm smile and “Buenos Dias!” Even little children offered the same. I kept looking for obvious gangsters and terrorists but there were none to be found- maybe they were staying at a different hotel! There were so many questions I wanted to ask: Who are they as people; why did they come to U.S.; what are their hopes; what are their fears? I couldn’t ask them directly because of language, but several volunteers who speak Spanish were able to provide great insight. The common theme is that people are coming here because of the extreme poverty and violence they face in their countries- they literally have no choice but to leave regardless of what they face in the United States when they arrive. They are sweet lovely people who will take the jobs that Americans no longer want. ​Sister Judy, a volunteer from New Orlean:​ She made it so clear- most of our ancestors came to the United States for many of the same reasons the asylum seekers come here today- we should welcome them. Glenn Blumhorst, a volunteer from Washington D.C., is President of the National Peace Corps Association. He is an expert because he lived in Guatemala for seven years, three and a half years as a Peace Corps Volunteer and three and a half years as a missionary. ​Sue, site coordinator at the hotel: As a full-time volunteer with an unimaginable commitment, she knows the asylum seekers as well as anyone could. ​I observed one drop-off of asylum seekers at the hotel. Given what they had been through and getting off a bus at who-knows-where to do who-knows-what, I expected to see very worn and perhaps fearful people. About thirty or forty women and children stepped off the bus, most with smiles on their faces. One by one they were welcomed by a Spanish speaking volunteer. 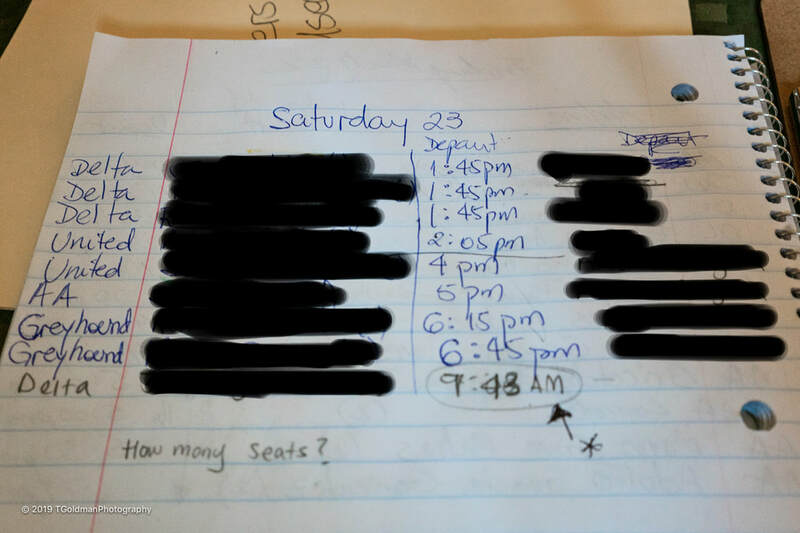 They filed into the breakfast area where they sat quietly for a short orientation, after which many darted for the restroom- perhaps ten at a time into a single person room. They then lined for a sumptuous lunch. While they were probably starving at this point, they were orderly and quiet, even the children- not a whimper. Beyond the warm friendly smiles and greetings I experienced at the hotel, there were two special moments at my hotel where asylum seekers were staying. This hotel offered a complimentary breakfast. One morning after I had filled a bowl with cereal, I moved to a counter which had a small refrigerator containing a pitcher of milk. A teenage boy, who I assumed to be an asylum seeker, was ahead of me finishing his bowl of cereal. He was done and could have simply walked away, but he didn’t. Instead he opened the refrigerator and handed me the pitcher of milk. I poured my milk and then he took the pitcher and replaced it into the refrigerator. I thanked him as warmly as I could in English and I’m sure he got the meaning. He smiled and went on his way. Did that really happen- from a teenager no less? The next day as I ate my breakfast, there was a tap on my shoulder. I looked up and there was a man saying: “Buenos Dias!” I reached out and shook his hand. 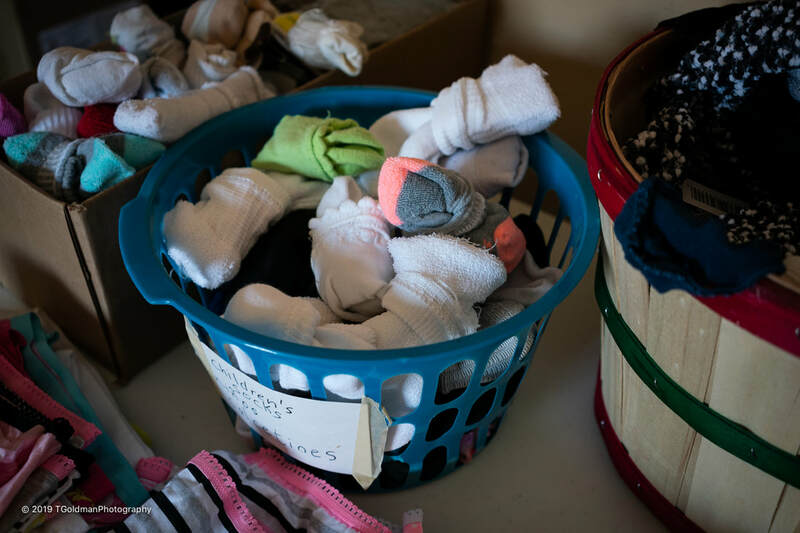 ​While we hear little about the true nature of the asylum seekers on the evening news, we hear next to nothing about the extraordinary volunteers who support organizations like Annunciation House. The system would not function at all without these generous people. Some volunteers are El Paso locals who often work a couple of days each week. Some are short term volunteers, typically two weeks, who travel to EL Paso from all over the country. Some are volunteers who stay for months on end. Many people do wonderful things for many great causes, but these volunteers are heroes! I continued my conversations with volunteers at the hotel. ​Sue, site coordinator at the hotel: She epitomizes the selfless commitment that volunteers make to provide aid and comfort to asylum seekers at the southern border. ​Glenn Blumhorst, President of the National Peace Corps Association: He explained what we all know to be true but often forget- getting to know people changes everything. Mary Bell, a volunteer from Philadelphia, is dedicated to supporting immigrants and refugees: She provided a unique insight into understanding the goals and struggles of asylum seekers. “Every day for the last two weeks I awakened energetic and ready to take on the world at the hotel. As I return to my hometown, Philadelphia, I recognize there are so many places, not exactly like El Paso immigrant shelters, but very similar. There are people who are lacking food, shelter, and clothing- their basic human needs to survive and thrive. Today I feel like I have let someone down by returning home because there is so much more to do and so much more that can be done, for example: hands-on volunteering and more importantly, policy changes, advocating for change to our current laws in order to eliminate the existing situation. I hope that people will reach out to their representatives and will be sure to vote. My body is telling me how tired I am or what I was not accustom too- eight to ten hours of constant care. I had renewed energy every morning I awakened in El Paso and reported for service. The cough, which is infectious- most of the volunteers get it, some worse than others. It caught up with me towards the last two days of my service time and right now all I want to do is sleep and pray that people will be kind and considerate to their fellow man and woman. There is something seriously wrong with a system that puts families and children behind bars. These are inhumane detention centers. Call for the release of all children and families being held by ICE against their will! 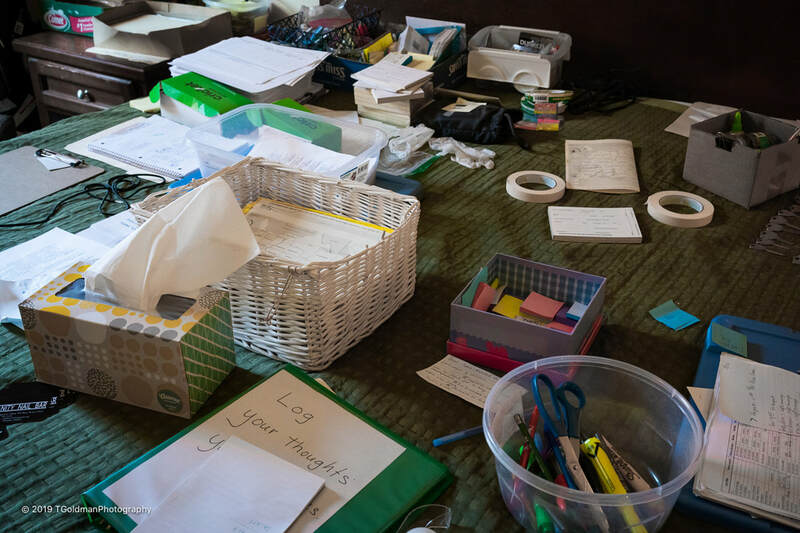 Mary’s words reflect the profound change that volunteers feel after their experience in service at the southern border. ​The Archdiocese of Philadelphia connected me to the Diocese of El Paso. 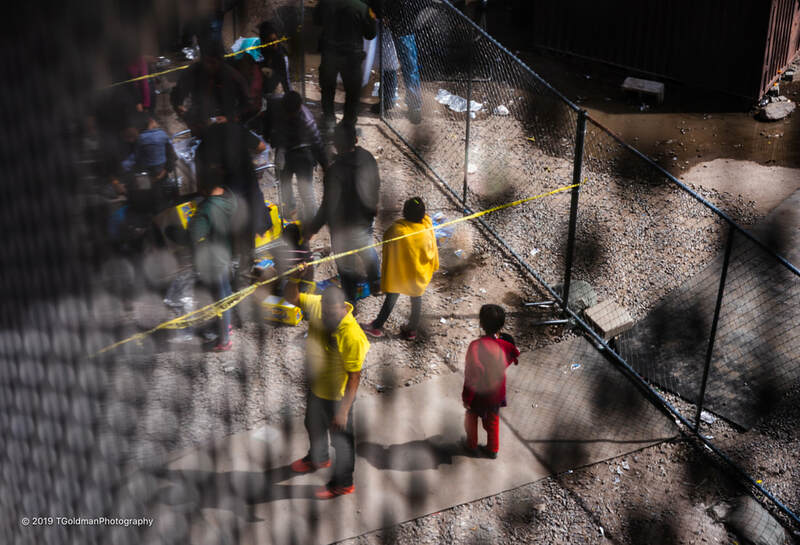 Under the leadership of Bishop Mark Joseph Seitz, the Diocese of El Paso opened a Migrant Center in coordination with Annunciation House. Most recently Bishop Seitz has put out an urgent call for volunteers. Fernie Ceniceros, Media Director, was kind enough to show me the Migrant Center, a large building on the beautiful campus. As we entered the front door of the Migrant Center, an asylum seekers passed by offering a hand to shake. Inside, the first sight was jarring to say the least. It was a large room with army style cots packed as tight as possible from wall to wall. Most were empty in mid afternoon but some were occupied. A large TV played shows for the kids. If only I could have captured this with an image. 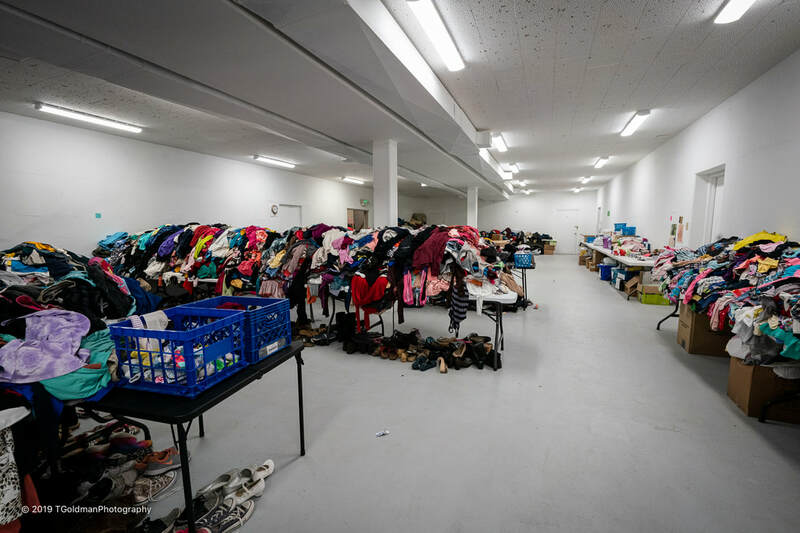 A most extraordinary part of the Migrant Center was the clothing room- a huge space with tables holding stacks of clothing looking like “Macy’s Bargain Basement” on steroids. 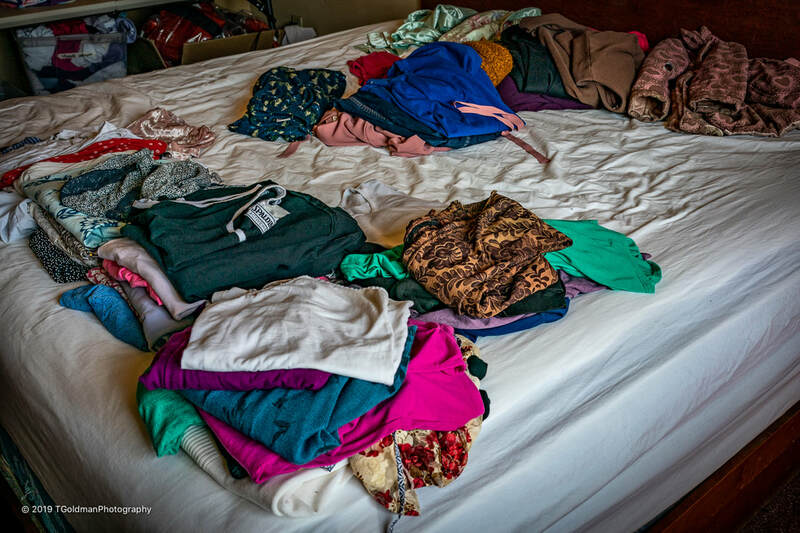 It was an awesome sight to behold and every stitch of clothing was donated- yet another humanity sighting! ​And the rows and rows of shoes- a classy pair of black and whites from another era. ​I returned later in the week to be interviewed by Norma Munoz, Anchor of The Bridge Catholic Radio at the Diocese of El Paso. 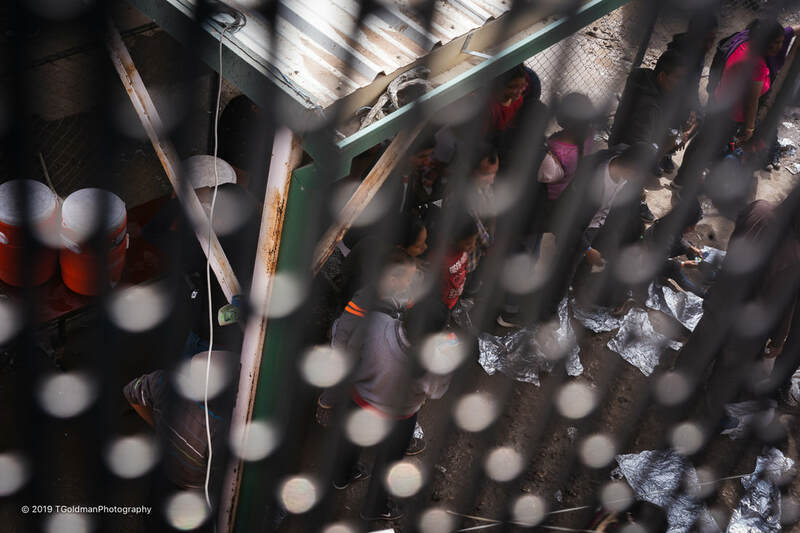 This discussion of my observations at the southern border can be found on The Bridge Catholic Radio’s Facebook page. 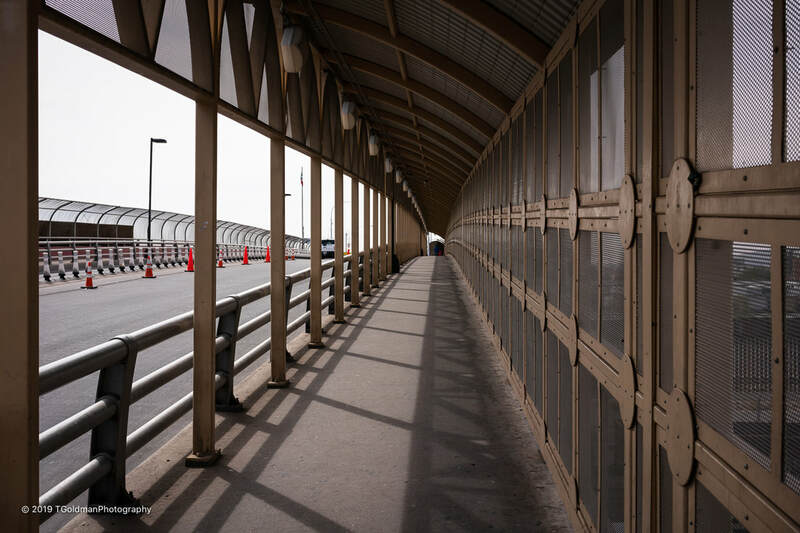 ​My expectation of the asylum seekers was that they would be hardened from their experience in their own countries, worn out from their journey, and angered by the welcome they received at the border. I guess the media drone had impacted me. What I saw in the people I met during the week can only be described as sweetness- people that I would like to know. I came looking for humanity, but I didn’t expect to be changed by what I would see, but that’s exactly what happened to me from their quiet presence. They are a very simple and down to earth people. They aren’t tarnished by greed that can often grow in a society with such plenty as we have in the U.S. The most common theme I’ve heard in my work about immigrants and refugees is that they work so very hard, taking jobs Americans don’t want. They are so much more of an asset to America than a liability. As amazed as I was by the asylum seekers, it was the volunteers who made me realize that the anger we so often see and hear these days does not paint a true picture of the fabric of America. I came to the southern border thinking that the Statue of Liberty was hanging her head in shame. If she came to an Annunciation House hospitality center at the southern border, her tears would dry! But if she went to that detention pen under the bridge, she would be saddened to the core. In the days ahead everything may come crashing down if the United States closes the border or simply refuses asylum seekers. If only we would work to stabilize countries so their people would not need to leave. There must be some sort of win-win that could be imagined. Surely the most innovative country on the planet is smart enough to figure out a way: Humanity Through Innovation! If you do volunteer, please share your experience with me on the contact page of my website. I would love to add your thoughts as an addendum to the story- as many as possible! Please reach out to your representatives in government to make your concerns known... And vote!! I was in the breakfast room of my hotel on the last morning. As I was about to add milk to my cereal, there was a man behind me waiting to put milk in his coffee. Remembering the teenage boy from the other day, I took the pitcher of milk from the refrigerator and handed it to the man: “Gracias” he said. 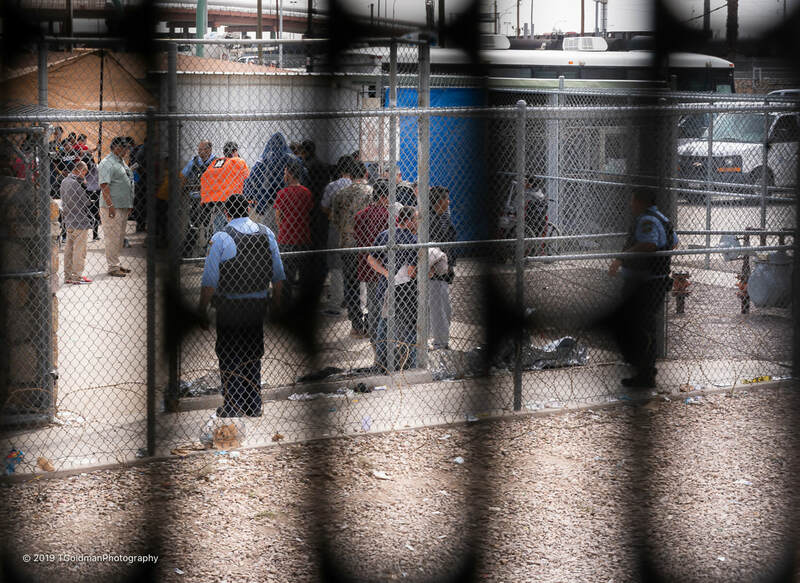 I went to the southern border looking for humanity in others. The asylum seekers taught me that I need to look for humanity in myself- a concept I never considered. It made me realize that if more people looked for their humanity and acted on it, we would surely be living in a better world.